Yeah, fake news. This is real reporting. LOL. Normally I would agree but I'll take my kind of fake news over this "real" stuff any day. Nevertheless, it will be killed on Sat. Dogghr, there are some baby thorns in that one pic but I could probably walk through it in jeans without a scratch. Haha. You can keep your "real" stuff. Are you talking to me? I'm comfortable with my masculinity while in my rose gardens tending roses. I have lots of wet low land, the mfr is plenty, the deer seem to be comfortable. Should I work to remove some? What else grows which could be better for them in areas which are wet ? Growing here that is better in wetter areas than MFR are red osier and/or silky dogwood, poplar, willows, alders and jewel weed for starters. Worse than or just as bad as MFR that grows here along wet areas is prickly ash. Buckbuilder and Tap like this. I was gonna go with dogwoods also as far as making better habitat in wet areas. MFR is good deer habitat, but it's like making a deal with the devil, he will promise you the good life and then destroy you. I'd work on eradicating it. Native Hunter, Buckbuilder and dogghr like this. Ditto on the dogwood varieties and they can be grown from cuttings. What does your area need most, cover or food? And what is you DPSM? Desirable food species like dogwood can be difficult to establish without protection. Bucks love to destroy dogwood, too. If your area has adequate food but lacks cover, then you may want to lean more toward a less desirable food type variety and go more toward cover varieties. FYI, I have plenty of MFR and my deer love the stuff. They will stand in healthy cover and eat the MFR that grows around the edges of the plots. I like having some MFR but I'm also eliminating some of it, too. I don't want too much of the stuff. I have a bunch of flowering dogwood that are growing well in mostly shaded, mature timber. This one's for you dogghr. 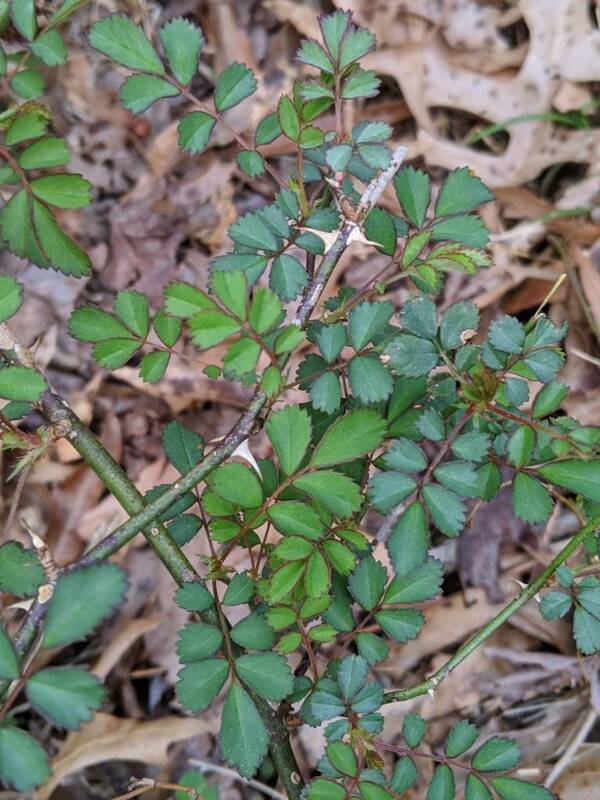 I found a couple more on my property with some rather lengthy thorns for the size plants they are. I had a tree stand in Ohio than over hung the mother of all MFR bushes. I honestly believed that if I ever fell from the stand into that bush, it would never release me. Just one branch of the stuff holds on tenaciously. I can't imagine what it would be like to be engulfed and swallowed up by a 12 foot high jungle of it. I did take some pics as it is worth noting for managers that MFR is not a lover of shade even tho it will grow there. If you manage property as a mature forest such as in back of my house, with 75-120 yo trees reaching over 120 ft in height, the GB thrives and MFR is nearly nonexistent. The deer, which I don't hunt here, had browse heavily on the GB. New growth saplings are so thick in this section, it is difficult to walk thru which my skin can tonight attest . Clear cuts or even extreme thinning promotes the invasive MFR unless like Chainsaw you spend time spraying and erradicating. Almost all my MFR at my farm is in sunny areas. Ha, now we can make fun of you and your wussy MFR! So far all that I've found has been confined to one general area on the only ridge on my property. Makes sense though as there tends to be more sunlight there. I should be able to knock it all back with a machete and some spraying in the coming weeks. Chainsaw and cutman like this.